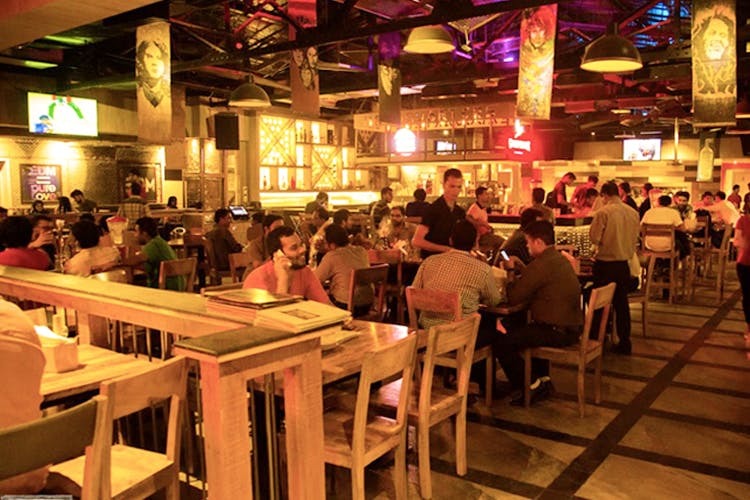 A spacious bar with rustic decor, live music and an awesome party destination, My Bar Headquarters is a star for being a budget-friendly option when you need to head out for drinks with your gang. With all-wooden furniture, brown interiors and ample seating space, this popular bar is far from dingy. Even if you’re a big squad, these guys are unlikely to have trouble accommodating you. They’ve got a live sports screen as well as live music sessions from Monday to Friday. Come weekends (Friday to Sunday), they’ve got some top-notch DJs playing kickass tunes for all the party freaks. Be it their food or drinks, we’d say everything’s value for money. The liquor rates start at just INR 99 for a pint of beer. So, we’d especially recommend making this one your go-to for when broke season is on. If you’re looking for a place that’s quite chilled out with a good-for-conversation vibe, this bar might not be it for you. Since the place is quite popular (read; crowded), it’s better to make a reservation beforehand. Do Jaeger Bombs at 314 Bucks at My Bar Headquarters!